This past Sunday was like a beautiful spring day, with temperatures in the low- to mid-50s, a rarity for early March. Michael and I decided relatively early in the day that it would be a shame for Muffin and Squeaker to spend the day inside. We had a couple of options: we could take them to the New England Aquarium again or to the Boston Museum of Science, but neither girl seemed particularly interested in either outing. We considered setting up a play date with some of their Brookline-based friends, but we didn’t get organized quickly enough to be sure not to disrupt another family’s schedule. But it would have been a shame to let the day go by without going out. And then we hit on an idea: let’s take the girls out on their first foray into a land of great treasures: Brookline Booksmith. While this was not their first foray into shopping, as they have gone with us into stores before, this was the first time that we were specifically going with the idea to let them choose what to buy. 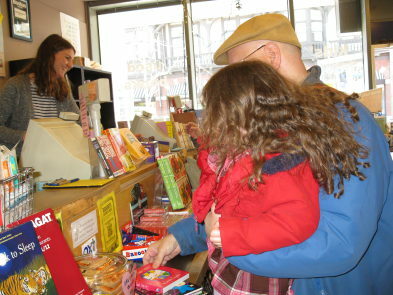 And going to bookstores is a family tradition. In fact, when Michael and I were dating, there were a few notable bookstore dates. Once, even, when we found that the movie we were hoping to go to at the (now closed) movie theatre at Copley Place was sold out, we went instead to the nearby (now closed) Lauriat’s bookstore. 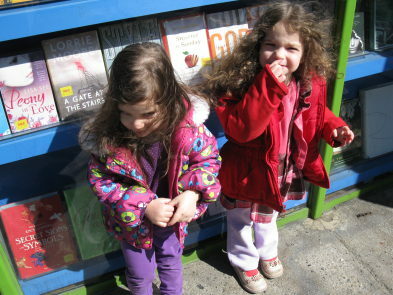 We asked the girls if they wanted to go out to see a bookstore, and they were immediately on board. In fact, Muffin had a shopping list: “I need purple books and green books and red books and yellow books.” Squeaker was more willing to go and see what might be available, rather than coming up with a list. So we finished getting all of us dressed and ready to go out, and off we went. We took the Green Line — the girls are already expert riders of public transit — and got to Coolidge Corner with minimal fuss. 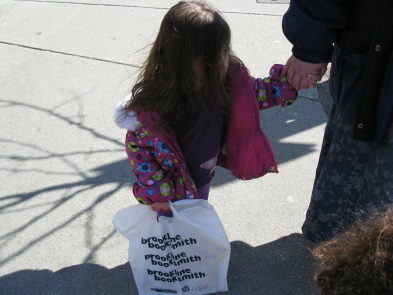 We then walked the block to Brookline Booksmith and ushered the girls inside. You know that idiom, “like a kid in a candy store,” to express excitement? For Muffin and Squeaker, replace “candy store” with “bookstore.” Our girls have each established their own “bed libraries,” collections of 20-30 books that must be in their beds every night in order for them to be able to go to sleep. So a whole store devoted to nothing but books was like paradise to them. Muffin almost immediately found one of the items on her list, a yellow book about Passover, on the shelves in the entryway. Squeaker was more reserved, waiting until we got to the children’s section at the back of the store to begin pulling books off the shelves. Squeaker was attracted to books she recognized, often exclaiming “I have this in my house!” when she found a familiar book cover. 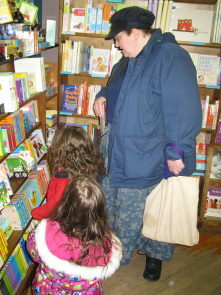 We know that this will not be the girls’ last trip to a bookstore. Even though Michael and I, like the rest of the world, do a lot of shopping online, we both feel that there is something special about going to a bookstore, getting an opportunity to hold books in your hand and page through them. 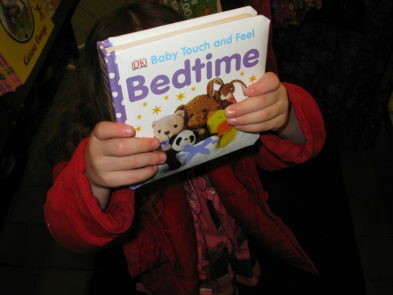 We have already begun to , and we hope to keep them interested in bricks-and-mortar bookstores. 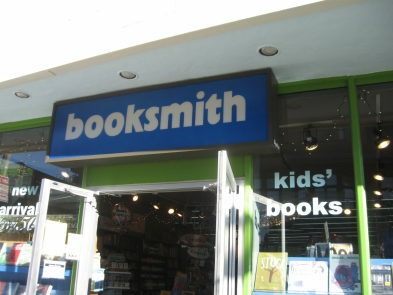 This entry was posted in Columns and tagged books, books for kids, Brookline Booksmith, Brookline shopping, childrens books, Coolidge Corner shopping, shopping for toddlers, shopping with toddlers. Bookmark the permalink.